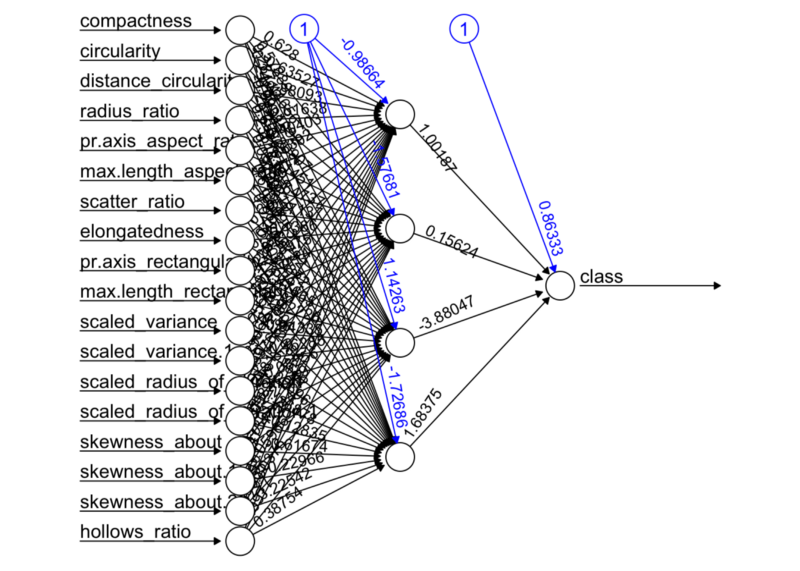 In this post, I am going to verify this statement using a Principal Component Analysis ( PCA ) to try to improve the classification performance of a neural network over a dataset. By Meigarom Diego Fernandes, __data though? Let’s think about this example: We have a dataset with a set of car properties. These properties describe each car by its size, color, shape, compactness, radius, number of seats, number of doors, size of trunk and so on. However, many of these features will measure related properties and so will be redundant. Therefore, we should remove these redundancies and describe each car with less properties. This is exactly what PCA aims to do. For example, think about the number of wheels as a feature of cars and buses. Almost every example from both classes has four wheels, hence we can tell that this feature has a low variance ( some rare buses have six wheels), so this feature will make buses and cars look the same, but they are actually pretty different from each other. Now, consider the height as a feature, cars and buses have different values for it, and the variance has a great range from the lowest car up to the highest bus. Clearly, the height of a vehicle is a good property to separate them. Recall that PCA does not take information of classes into account, it just looks at the variance of each feature because it is reasonable to assume that features that present high variance are more likely to have a good split between classes. Often, people end up making a mistake thinking that PCA selects some features from the dataset and discards others. The algorithm actually constructs new set of properties based on combination of the old ones. Mathematically speaking, PCA performs a linear transformation moving the original set of features to a new space composed by principal components. These new features do not have any real meaning for us, only algebraic, therefore do not think that PCA will find new features that you have never thought could exist. Many people still believe that machine learning algorithms are magic, they put a thousands of inputs straight to the algorithm and hope to find all insights and solutions for theirs business. Do not be tricked. It is the job of a data scientist to locate the insights to the business through a well-conducted exploratory analysis of data using machine learning algorithm as a set of tools and not as a magic wand. Keep it in mind. 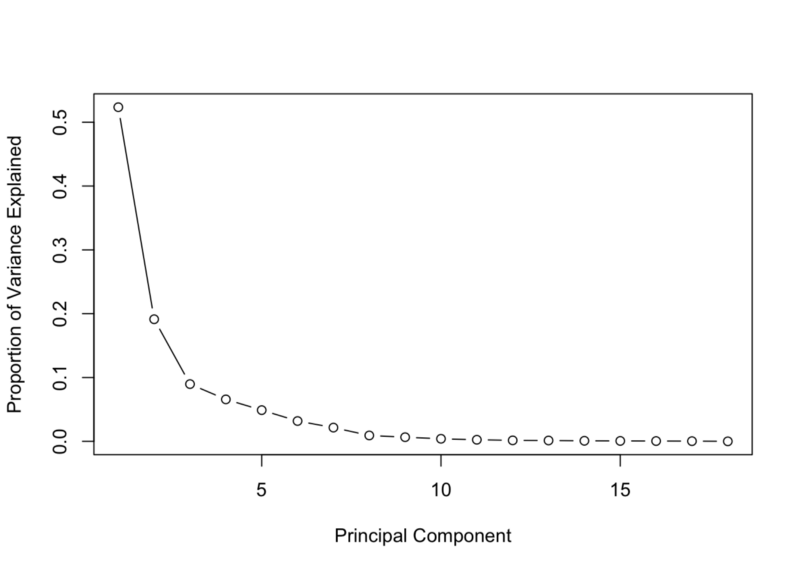 How does the principal component space looks like? In the new feature space we are looking for some properties that strongly differ across the classes. As I showed in the previous example, some properties that present low variance are not useful, it will make the examples look the same. On the other hand, PCA looks for properties that show as much variation across classes as possible to build the principal component space. The algorithm use the concepts of variance matrix, covariance matrix, eigenvector and eigenvalues pairs to perform PCA, providing a set of eigenvectors and its respectively eigenvalues as a result. How exactly PCA performs is a material for next posts. So, what should we do with eigenvalues and eigenvectors? It is very simple, the eigenvectors represents the new set of axes of the principal component space and the eigenvalues carry the information of quantity of variance that each eigenvector have. So, in order to reduce the dimension of the dataset we are going to choose those eigenvectors that have more variance and discard those with less variance. As we go though the example below, it will be more and more clear how exactly it works. Let’s finally see some code. Now, we reached the fun and interesting part of this post. Let’s see if PCA really improves the result of classification task. In order to comprove it, my strategy is to apply a neural network over a dataset and see its initial results. Afterwards, I am going to perform PCA before classification and apply the same neural network over the new dataset and last compare both results. The dataset is originated from UCI machine learning repository called “Statlog ( Vehicle Silhouettes ) dataset”. This dataset stores some measures of four vehicles’s silhouettes with the purpose of classification. It is composed by 946 examples and 18 measures ( attributes ) all numerics values, you can check more details here in this link: https://archive.ics.uci.edu/ml/datasets/Statlog+(Vehicle+Silhouettes). 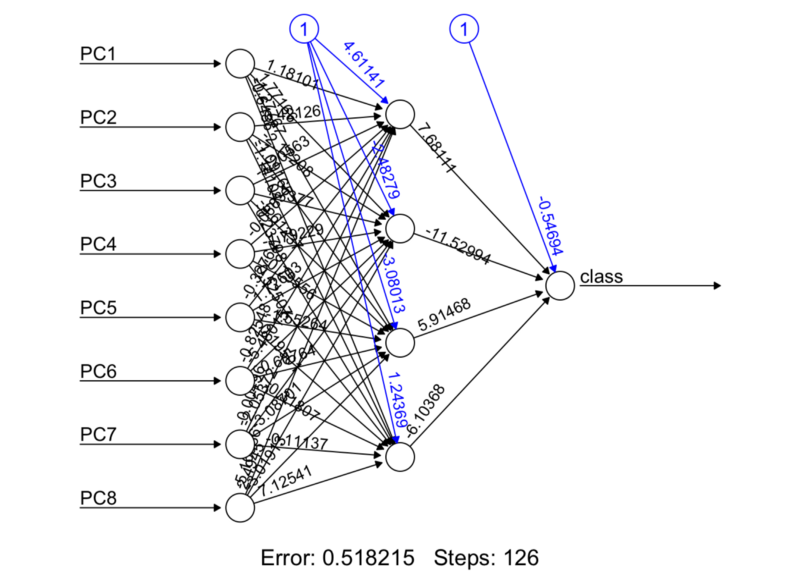 The neural network will be a MultiLayer Perceptron with four hidden nodes and one output node, all with sigmoid function as activation function and PCA functions will coming from a R package. First of all, I am going to prepare the dataset for binary classification. I am going to select examples only from two classes in order to make up a binary classification. The examples will come from “bus” and “saab” classes. The class “saab” will be replace by class 0 and class “bus” will be replaced by class 1. Next step consists in to separate the dataset into training and testing datasets with 60% and 40% of the total class examples, respectively. After previous dataset preparation, let’s model a neural network using all features at once and then to apply the test dataset. It seems we got some results. Firstly, take a look at the confusion matrix. Basically, confusion matrix says how much examples were classified into classes. The main diagonal shows the examples that were classify correctly and secondary diagonal shows misclassification. In this first result, the classifier shows itself very confused, because it classified correctly almost all examples from “saab” class, but it also classified most examples of “bus” class as “saab” class. Reinforcing this results, we can see that the value of accuracy is around 50%, it is a really bad result for classification task. The classifier has essentially a probability of 50% to classify a new example into “car” class and 50% into “bus” classes. Analogically, the neural network is tossing a coin for each new example to choose which class it should classify it in. Now, let’s perform the principal component analysis over the dataset and get the eigenvalues and eigenvectors. In a practical way, you will see that PCA function from R package provides a set of eigenvalues already sorted in descending order, it means that the first component is that one with the highest variance, the second component is the eigenvector with the second highest variance and so on. The code below shows how to chose the eigenvectors looking at the eigenvalues. The native R function “prcomp” from stats default packages performs PCA, it returns all eigenvalues and eigenvectors needed. 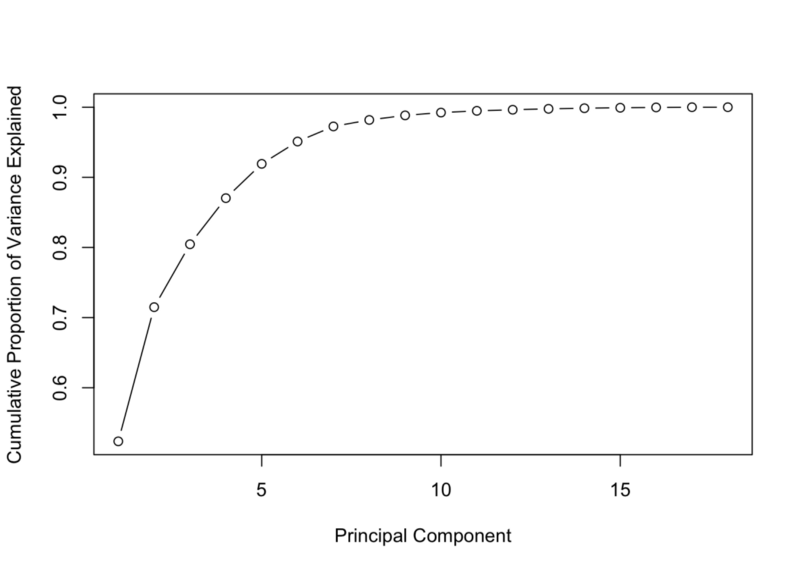 The first plot shows the percentage of variance of each feature. You can see that the first component has the highest variance, something value around 50% while the 8th component is around of 0% of variance. So, it indicates that we should pick up the first eight components. The second figure show an another perspective of the variance, though the cumulative sum over all the variance, you can see that the first eight eigenvalues correspond to approximately 98% of the all variance. Indeed, it is a pretty good number, it means that there is just 2% of information being lost. The biggest beneficial is that we are moving from a space with eighteen features to another one with only eight feature losing only 2% of information. That is the power of dimensionality reduction, definitively. Now that we know the number of the features that will compose the new space, let’s create the new dataset and then model the neural network again and check if we get new better outcomes. Well, I guess we got better results now. Let’s to examine it carefully. The confusion matrix shows really good results this time, the neural network is committing less misclassification in both classes, it can be seen though the values of the main diagonal and also the accuracy value is around 95%. It means that the classifier has 95% chance of correctly classifying a new unseen example. For classification problems, it is a not bad result at all. Dimensionality Reduction plays a really important role in machine learning, especially when you are working with thousands of features. Principal Components Analysis are one of the top dimensionality reduction algorithm, it is not hard to understand and use it in real projects. This technique, in addition to making the work of feature manipulation easier, it still helps to improve the results of the classifier, as we saw in this post. Finally, the answer of the initial questioning is yes, indeed Principal Component Analysis helps improve the outcome of a classifier. As I mentioned before there are other dimensionality reduction techniques available, such as Linear Discriminant Analysis, Factor Analysis, Isomap and its variations. The ideia is explore advantages and disadvantages of each one and check its results individually and combined as well. 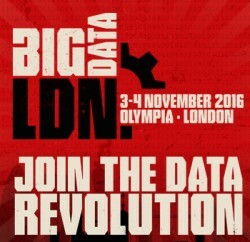 Would LDA combined with PCA improve the classifiers outcome? Well, let’s investigate it in the next posts. Thanks for your time reading this post. I really appreciated, feedbacks are always welcome. Bio: Meigarom Diego Fernandes is an engineer that has fallen in love with data. He is the biggest fan of Machine Learning algorithms and data Science jobs. Must-Know: What is the curse of dimensionality?